Truecaller is one of the widely used smartphone app for identifying the unknown callers. It is used by million of people just to get rid of the mystery beyond the unknown numbers. It doesn’t depend on any mobile service operators to identify the numbers. Truecaller upload your contact list while you are installing the app and wise verse it will retrieve the information previously stored in their server while you search for the unknown numbers. On one hand its very useful to identify the person behind the unknown numbers while going back to the other side, if you look at some one, the same thing will happen in counter verse anyone can look at you using your number. Let us consider if you mistakenly dialed to a unknown person, then there may be a chance he can identify you and misuse your identity. The risk factor increases that unknown person will easily identify you because it displays the location and mostly contacts are suffixed or prefixed with some specific name such as organization or institute name or something else which makes the search simple. So its better to know how to unlist your number from the Truecaller’s database for your privacy reason. Truecaller itself provide a option to unlist a number from its directory. 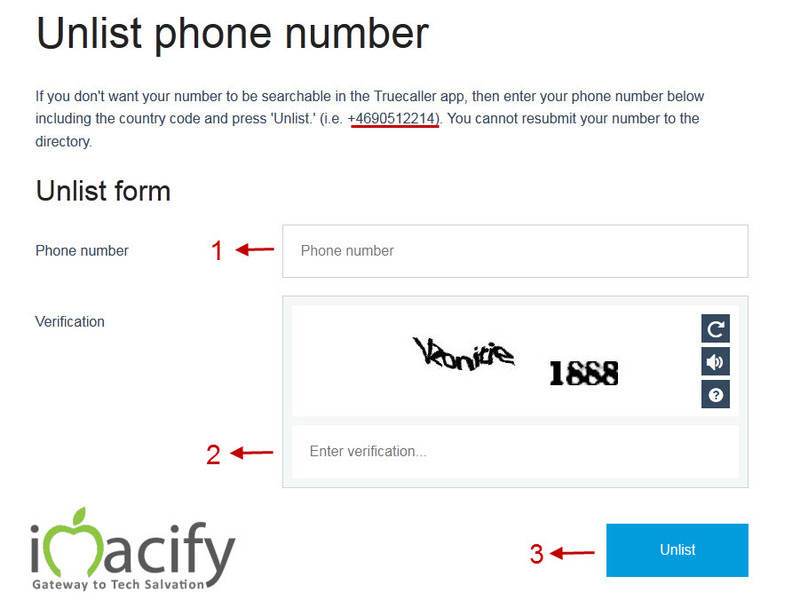 You can unlist your number from Truecaller in simple easy steps. Visit this link http://www.truecaller.com/unlist. You will redirect to the Unlist Page. That’s all done, your number is unlisted from the Truecaller directory within a matter of minutes and sometime it may take time of maximum of 24 HRS. Now you can check your number in Truecaller database, it will show the result ” No Match Found”. Now your number is permanently unlisted from the Truecaller database. Only your number is unlisted from the directory and still you can see unknown numbers in Truecaller database. You can add back your number to the list if you use a Windows Phone, Android or iPhone. You can relist your number by re-verifying your phone number. Open the app > settings > “3-dot menu” > Deactivate > then verify your number again and write your name then within 24 hours your name will be updated. If you are not using neither of the mentioned devices then provide your name and phone number including country code to the Truecaller support team and within 24 hours your number is added to the list. If I unlist my identity from truecaller will the people I viewed their profile be able to know I did so? Thanks for info. can you list out the most useful smartphone apps in single post. you can verify it by simply searching ur number in true caller. type all. I have waited for more 48hrs, and it is still listed on true caller. Please rectify the issue asap. If you have registered an account with Truecaller, you need to deactivate it first in order to unlist. after that just fill the unlist form and confirm your corresponding number with verification code. Unlist from true caller, it will hide your identity. if you unlist, that fb ID will not work on true caller anymore. I don’t even know that i am registered or not and don’t know what to do to deactivate my account. Can you help me? I have deactivated my accnt and also unlisted but I didn’t get any option saying unlit successfully done Iam still confused my contact details are still visible..plz help I donot want my address Ti be visible To anybody. If you have registered an account with Truecaller, you need to deactivate it first in order to unlist. it takes minimum of 48 hrs for processing !!!! LOL !!! There is no option to delete your number from my side as i am also a simple user like you according to true caller. There are some terms in truecaller to disable your number from it. Deactivation happens only if permanently get out of that . That is you have to deactivate your truecaller account which is bind with the corresponding number. IF MY ACCOUNT IS THERE WITH U DELETE MY TRUECALLER ACCOUNT. I am not able to unlist my personal no in truecaller site. I wished to unlist my number. as i m very disturbed by unwanted calls so pls do it with immediate effects. Sorry we are not associated with True Caller. Did you deactivate your truecaller account ??? I have unlisted my number from truecaller. If any of my friend installs this application, will my identity added to truecaller’s database again ? No it will not !!! Is there a way to find out from whose contact list my number got added to truecaller database?.Please help me with it. Couse someone has saved my name more embarassingly..so please. reply asap.Thanks in advance. You can not able to find who saves your name in that manner. But you can unlist the number, so others can’t get that name on their phones while you phone them. Is there a way to find out from whose contact list my number got added to truecaller database? Please tell me asap because my name has been saved by someone in embarassing way. How my Number is being listed in truecaller database though I have never Installed truecaller or registered my phone number over truecaller. A friend told me that he got my number from truecaller although I have never used or registered my number on Truecaller. Is it possible and how….. Yes possible, if any one of your friend holding your contact details may be the user of Truecaller , Truecaller get your details from them. Someone else’s Facebook picture with my gmail profile picture appears on my number when dialed on true caller. I have changed my mail but it still appears. Dear God, who is witch hunting me? Somebody Help help hellllppppppp…. I SEARCHED for one of my exes on Truecaller. Of course I didnt use the option of ask for details. I just looked her up. Can she know that I looked her up? I have just unlist my number from truecaller,How long it will take to remove the number and name from the truecaller data.And after unlisting the number,if anyone search my number what message it will show..? Will it show my number and name..? No, It wont show after few hours. I had deactivated my account and unlist my number from truecaller. I had tried this 3-4 times. but when i searched my number it shows my name.Can you please help me and give me the right guidance how to do it permanently. Deactivation takes some time. So please check after 24 HRS. have you received my messages..? Nope! check your mail for further details. Thanks very much for the tips. 3/ when i used the apps (before I deactivated my account), i have removed photos from one of my contact from my phone, it seems it gets syncronized correclty because this photo did not show up anymore on my mobile, is the pics also not showing upfor the other users or is it only my view which as changed.. how to ensure? It’s been 1 month I had been unlisted my phone no. From Truecaller,but still Truecaller is showing last seen on Jan 5 the like with green symbol and to other no. As available even after I m not using Truecaller , why like this so ? It’s showing as available with green symbol even after I m not using Truecaller . Came to know this when I checked from other mobiles . Even after unlisting phone no. From Truecaller, it is showing as available with green symbol when I checked from other mobiles, why like this , please how to solve this issue,kindly inform me .